I decided to try a style from Her Best Hair, which is day 7 of her “30 Styles in 30 Days” challenge. I love her styles! Of course I did it with minor variations. I didn’t add the bang in the front because I like to keep my hair away from my face. I don’t want any unnecessary breakouts. I also bunned the back of my hair upward instead of bunning it downward because the top portion of my hair isn’t long enough for a smooth bun. I like the way it came out and I’m pretty sure it’ll be my style for the week. 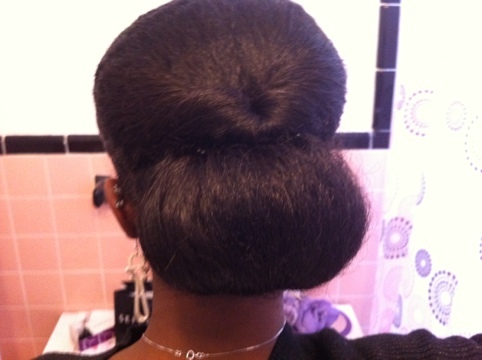 I like that I can bun it without my bun-maker and it doesn’t look small. 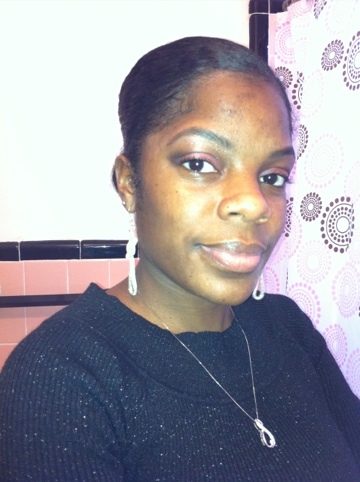 Thanks to Tia- Shanté of Her Best Hair! Check out her YouTube video for this style! I finally completed my Grow Out Challenge Update post for Hairscapades. I’m not sure when it will post though. Writing the post made me realize just how many styles I’ve tried over the past few months. 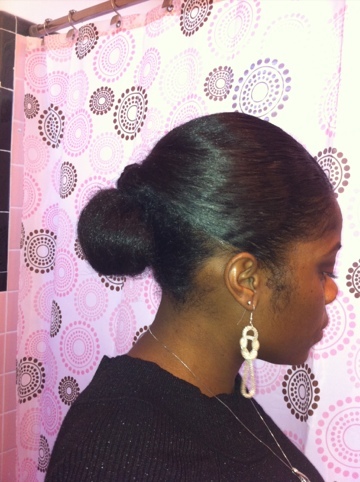 I straightened my hair (twice), I’ve done mini-twists (twice), I’ve done a twist and curl and of course the numerous buns. I’ve realized that my Product Junkie ways have subsided. How sad is that?! I must revive those bad habits immediately. Last week, I straightened my hair again. Mainly for the purpose of looking my age. I had somewhere to go where I needed to be looked at as the adult that I am… and my buns tend to make me look a lot younger than I am. LOL. It’s still straight now, but it’s pulled back in a bun. This weather is just too much for my natural hair. I wonder what hairstyle I’ll try next. Oh yes! So I trimmed my hair again this time when I straightened it. That’s the only way to get rid of all of the ssk’s… eventually. My hair feels a lot healthier after this recent trim.